Roque informally renounced his support of North Bergen mayoral candidate Larry Wainstein. West New York Mayor Felix Roque walked back his endorsement of North Bergen mayoral candidate Larry Wainstein. North Bergen and West New York both have 2019 mayoral elections just months away. As with most concurrent elections in Hudson County, they will likely influence one another. In May of 2018, West New York Mayor Felix Roque made local headlines as the first elected supporter of North Bergen mayoral candidate Larry Wainstein, who is running against current North Bergen mayor and state senator Nicholas Sacco. This announcement came a full year ahead of the upcoming May election. However, it seems that Roque’s support for the anti-Sacco candidate may be wavering as his own electoral campaign faces challengers. Roque said that issues in his own town take priority over being vested in North Bergen. These West New York issues include keeping taxes stable, crime rates low, and keeping the new splash park area in Miller Park up to par for the upcoming summer season. This could signify the loss of Wainstein’s most significant ally so far in his third attempt to become mayor of North Bergen. Roque’s support of Wainstein, Sacco’s longtime adversary, first surfaced in the wake of the disagreement among Hudson County Democrats over whether to support the reelection of County Executive Tom DeGise. In that election, Roque sided with the mayors who wished to support a new executive, while Sacco endorsed Tom DeGise. Roque also supported Union City Mayor Brian Stack over Amy DeGise in the contest for chair of the Hudson County Democratic Organization (HCDO), another endorsement in conflict with that of Sacco’s. It was during this rift among Hudson County mayors that Roque announced his support of Wainstein at one of his early campaign events in May 2018. In a speech he claimed that Wainstein’s candidacy served the best interests of North Bergen residents. Swibinski said this was one way that Roque “lashed out” against Sacco. Swibinski also noted that on Dec. 3, Roque hired Henry Marrero, a retired North Bergen Police sergeant, as a confidential aide. Marrero had ties to Wainstein in 2015, according to Swibinski. “It’s just another way of escalating the feud with Sacco,” Swibinski said. As the campaign for HCDO chair unfolded and as conflicts over the county executive race emerged, the challenges to Roque’s own incumbency began to gain traction. Commissioners Gabriel Rodriguez, Cosmo Cirillo, and Margarita A. Guzman, who all hold office under Roque’s administration, aim to break from the current leadership. They, along with running mates Victor M. Barrera and Yoleisy Yanez will be running in the 2019 election under the “New Beginnings” ticket. Commissioner Rodriguez would replace Roque as mayor if the ticket won. Roque, on the other hand, has yet to announce his slate for 2019. Prior to the “New Beginnings” ticket being announced, Congressman Albio Sires, a former West New York mayor, made it public that he also wanted Roque replaced. Had Roque continued backing the Wainstein campaign, he would have added Mayor Sacco to the elected officials ranged against him. 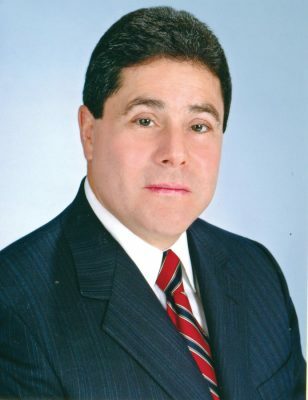 North Bergen candidate Wainstein ran unsuccessfully in both 2011 and 2015 against incumbent State Senator and Mayor Nicholas Sacco, and has opposed the Sacco administration for nearly a decade. This year, Wainstein’s slate includes Juan Almanzar, a clinical social worker licensed in New Jersey and New York; Alcides Siri, a mechanical engineer who currently works as an inspector for DataScan Field Services, a Canadian-based appraiser; Veronica Castrillon, a New York-based architect; and Eduardo Céspedes, an auditor at a New Jersey-based accounting company. During his third go at a mayoral bid, Wainstein drew attention when he filed a suit on Dec. 7 against North Bergen’s Board of Education to bring a halt to a referendum that Mayor Sacco supported. He claimed that the referendum was in violation of the state’s Open Public Meetings Act. Ultimately, his case was thrown out in favor of the referendum, which allotted $60 million in bonds for the ongoing expansion of North Bergen High School. He is also founder of North Bergen Concerned Citizens, a local group of residents who have endorsed each of his campaigns. After attempts to reach him by phone and email, Wainstein could not be reached for comment.